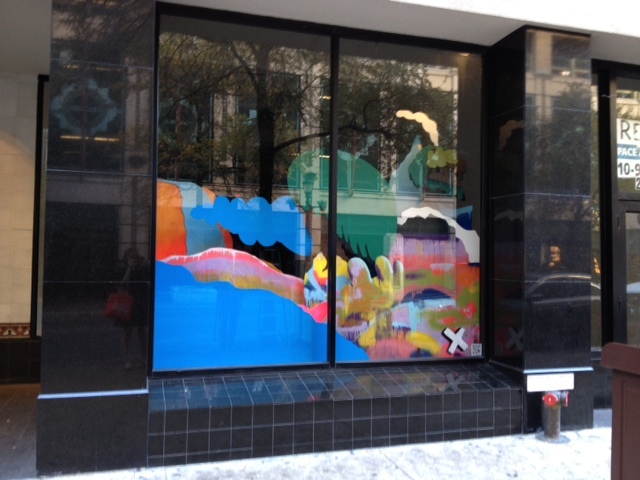 As part of the City of San Antonio’s first Center City Open House, X MARKS THE ART collaborated with the Center City Development Office to commission Rex Hausmann to create vibrant window displays on the facade of the Melrose Building, located at 201 W. Commerce St. The installation titled Every Town is a Topic, presents Hausmann’s experience of San Antonio as a “little big town” with influences from all over the world. Hausmann brought in fellow Hausmann Millworks artists David Almaguer, Kyle Martin, and Mark Gelatt, to contribute art work to the event. 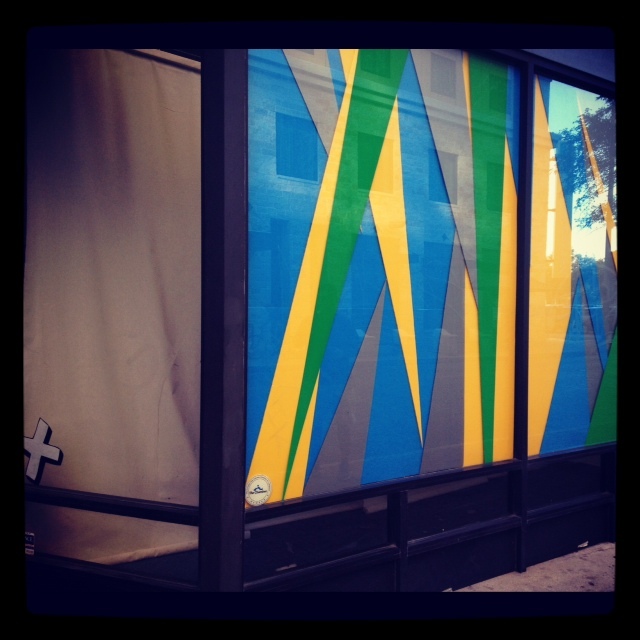 David Almaguer painted colorful lace patterns on the upstairs windows and exhibited his paintings. 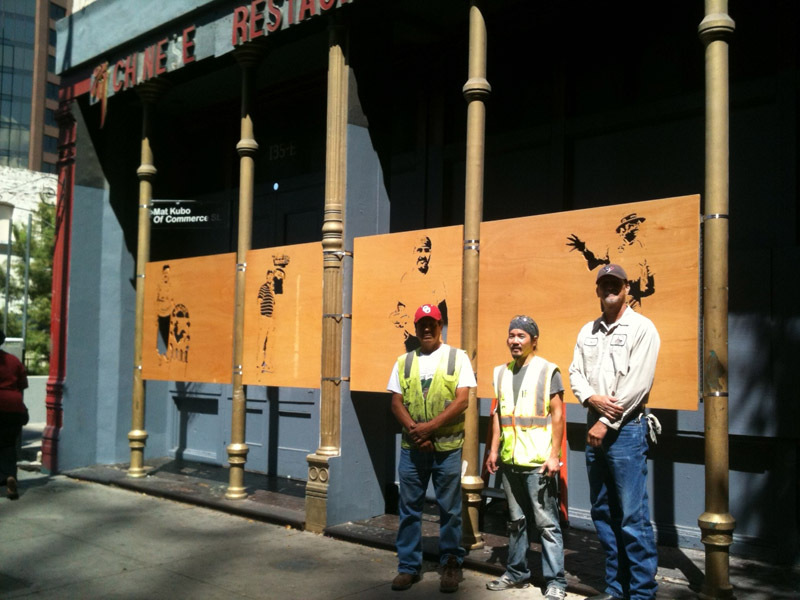 Kyle Martin hung his portrait paintings in the interior and in the east facing windows. Sculptor Mark Gelatt filled the space with sculptures. 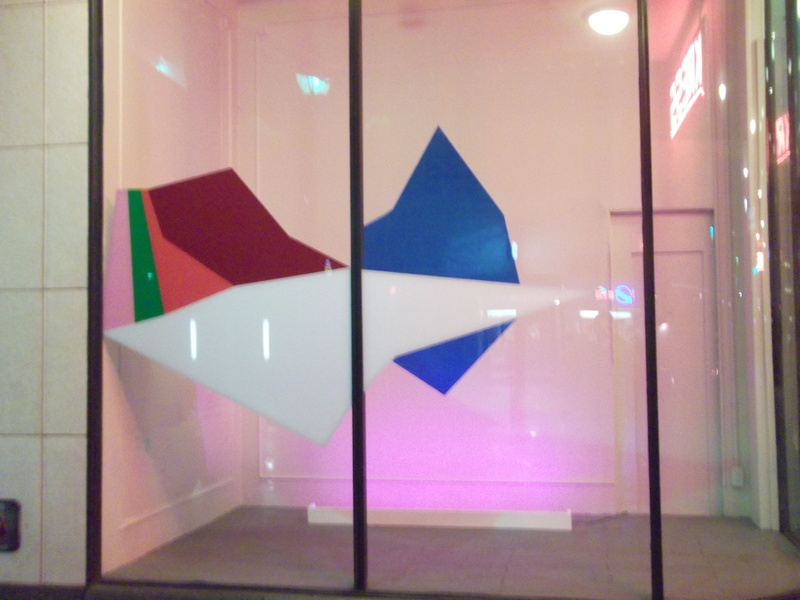 The event was last Tuesday, May 28th, but the window installations will remain on view through June, and possibly longer. The Center City Open House was the first in a new quarterly series hosted by the Center City Development Office. 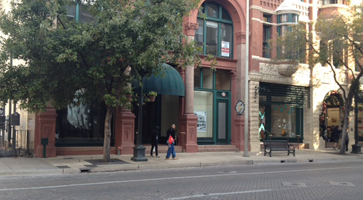 The Center City Open Houses provide a unique networking opportunity and showcase underutilized spaces, encouraging investment in San Antonio’s vacant historic buildings. The event was made possible with partnerships between the Office of Historic Preservation, and the Department for Culture and Creative Development. In addition to the visual art installations, Ballet San Antonio lit up the evening with dance performances and San Antonio fashion designer, Agosto Cuellar, coined “Wild Card Cuellar” by Project Runway’s Tim Gunn, glammed the evening up with his signature spin on fashion. The event featured complimentary drinks from Freetail Brewery and international hors d’oeuvres by Ming’s Thing. 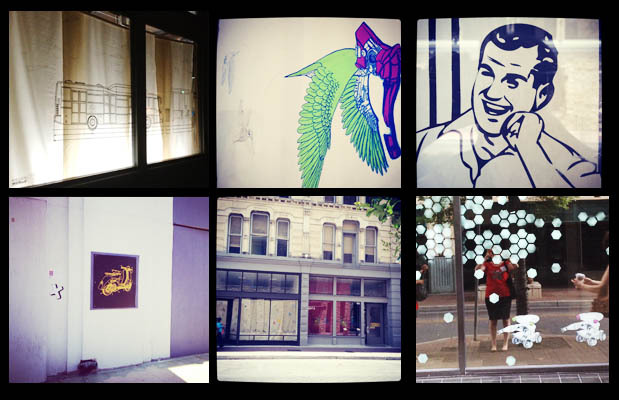 Stay posted for the next Open House, and check out the window installations next time you’re downtown. 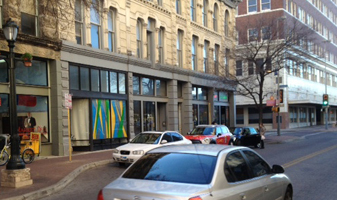 The building is directly across the street from City Hall on the corner of Flores and Commerce Streets. 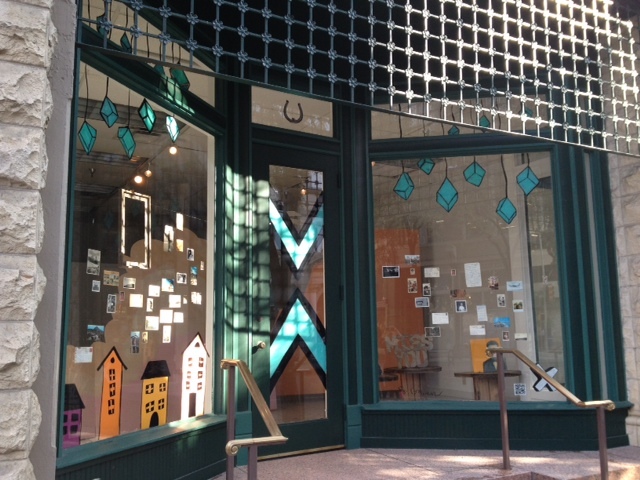 The City of San Antonio’s program, X MARKS THE ART, is designed to activate vacant downtown storefronts and underutilized spaces by introducing visually dynamic art installations and happenings to attract the public downtown to experience art. 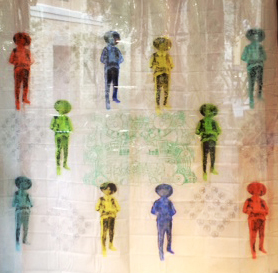 It is presented by Public Art San Antonio (PASA), a division of the Department for Culture and Creative Development. 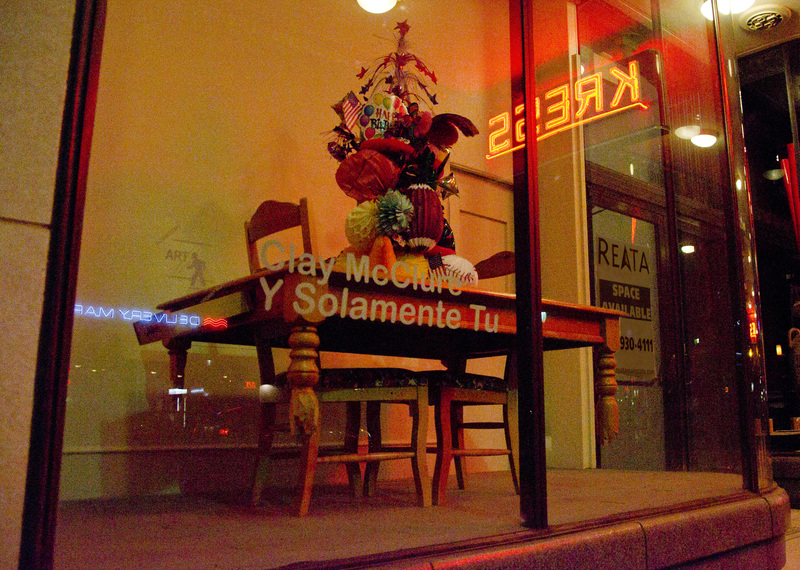 Organized by PASA with the services of a lead artist, Cruz Ortiz, the exhibit, Cut and Paste, features over 15 installations, representing 22 artists, in 13 vacant downtown properties. The installations will be on view for up to six months beginning in December, 2012. Installations respond loosely to the technical and creative possibilities of “cutting” and “pasting” and thematically convey the artist’s expression of living, working and playing downtown. 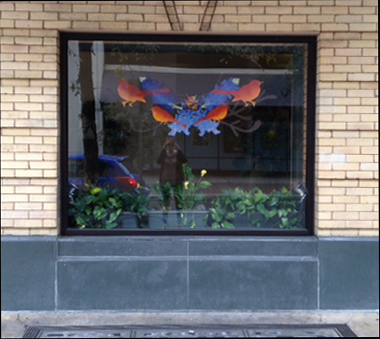 Adriana Garcia has cut intricate illuminated designs of hummingbirds out of paper and vinyl and installed and illuminated them inside an old movie ticket booth which was part of the historic Texas Theater that today remains as the façade of the IBC Bank Building. Garcia’s affinity for the birds began when she used these images in an artwork she gave away as a wedding gift. “I heard once that birds were divine gods flying around us, inspiring us… The humming bird is the only bird that can fly up and down, and backward and forward—making them perfect for time travel,”says the San Antonio born artist. Garcia earned her BFA from Carnegie Mellon University in Pittsburgh, PA and also studied art at La Universidad Politecnica de Valencia in Spain. Adriana has worked extensively as an artist, set designer, educator, actor, editor and graphic designer independently and for various cultural organizations. “History is made up of hearsay, tall tales and legends. No state embodies this more than Texas and no other Texas city more than San Antonio,” says Robert B. Gonzales, whose piece uses famous quotes of and about these legends and gives them a graphic subversion. His piece is a hybrid of info-graphic and conceptual art. The flat, machine-made precision of the cut vinyl gives these historical didactics an aura of authority, while the quirky juxtapositions of the texts and images—myth and facts, suggests history is a fluid interpretation of the past. Robert “Beto” Gonzales is both an artist and graphic designer who has exhibited widely across texas and in Los Angeles. He is known for his bold, graphic artworks that mix time and cultures together in unexpected ways. Esteban Delgado is known for his vibrant geometric paintings. 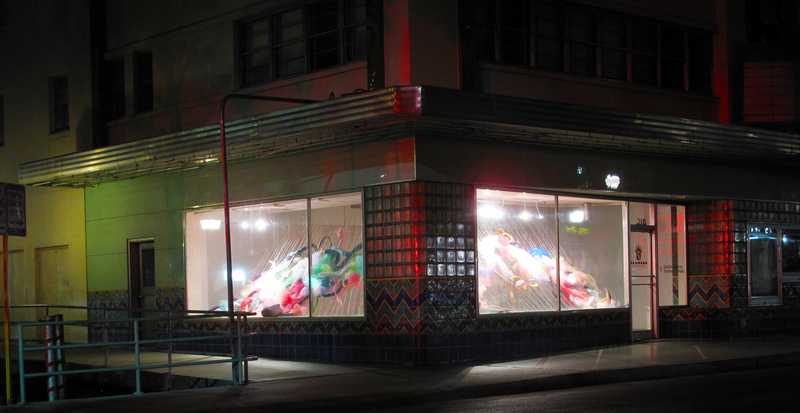 For Cut and Paste he has brought a bright, colorful application of corrugated plastic and vinyl to the interior windows of the historic Savoy Building. The colors were chosen to balance the warm stone above and the cool grays at street level. Delgado has an impressive exhibition history throughout San Antonio and is a member of the Lullwood Group, a local art collective that encourages participation, fosters exploration and promotes art discovery in many forms. Delgado was recently selected by Idea Fund to receive support to realize his project Something old, something new, something borrowed, something blue that will transform the façades of vacant buildings in small towns in South Texas, including – Alice, Bishop, Falfurrias, Riviera and Robstown – through window installations of bright, colorful compositions and vinyl artwork informed by the history of each structure and the surrounding community. In 2011, Rigoberto Luna worked with local photographer, Amber Rodriguez, on a photo project documenting boxer and current WBC Champion Joseph Rios. He was introduced to 3 generations of fighters, all of whom continue to stay very active in the sport, as trainers, promoters or boxers. He also witnessed the insane training process, the incredible commitment that fighters, young and old, professional and amateur, put into the sport. His installation sheds light on the San Fernando Gym, its history, its champions, its new generation of fighters and its multi generations of families that have gone unnoticed in its 25 years of existence (Anniversary: Sept 13, 2012, San Fernando Gym is located at 319 W Travis St.). In addition to his art practice, Luna is a full-time graphic designer having studied graphic design at Pratt Institute in NY. To Jenelle Esparza, palmistry is more of an art than a science. “Our hands and palms are common features in everyone yet we each hold a completely individual mark that is unique to every person; not even twins are the same,” says Esparza. Her installation contains large-scale printed images of palm prints, accompanied by philosophical quotes. The prints emphasize the individual and unique lines of the palms of different people from the community and give everyone a simple portrayal of existence, our life, and our connection with each other through our individuality. Esparza graduated from UTSA in 2010 with a BFA in Photography and has exhibited across San Antonio. Zane Carroll’s installation is a response to his experience as a U.S. soldier, “Trench art refers to art created by soldiers in the context of warfare with materials available during warfare, reflecting the tastes and philosophies of the generation from which it was created,” says Carroll. As an artist and a soldier himself (serving as an Army Combat Medic and Engineer) he sees his work as part of an evolution of trench art in a post 9-11 era . 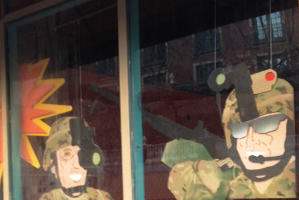 In his artist statement he explains, “The subjects in my work reflect the confusing definition and experience of this new warfare, and how soldiers see and identify themselves in this new context. The Arabic symbol means ‘infidel,’ a term used by the enemy to negatively describe American Soldiers. Soldiers have proudly and jokingly embraced the term as sort of a compliment. They have even used the term to label t-shirts and their bodies with tattoos like a brand name in an effort to reappropriate it.” Carroll earned his MFA from Texas Tech University and his BFA from Rocky Mountain College of Art and Design in Colorado. He teaches art at Lee High School and is Co-Director and Resident artist at Clamp Light Studios and Gallery. Sage Gibson has created a super-sized chandelier that is installed in an exposed storefront space that was formerly Potchernik’s Sporting Goods. Gibson is an architectural designer and freelance artist who maintains Sage Studio, a large art & design studio and gallery, and has exhibited nationwide. As an artist, Sage says she finds herself constantly reinterpreting the meaning and role of art, and produces works in multiple mediums, with a preference for acrylic painting. Gibson received her BFA from UTSA and her work is influenced by the colors and rhythms of our state and nearby Mexico. Matt Damien Ritchie’s installation is a vivid three dimensional assemblage, constructed of multiple layers of colored Coroplast. 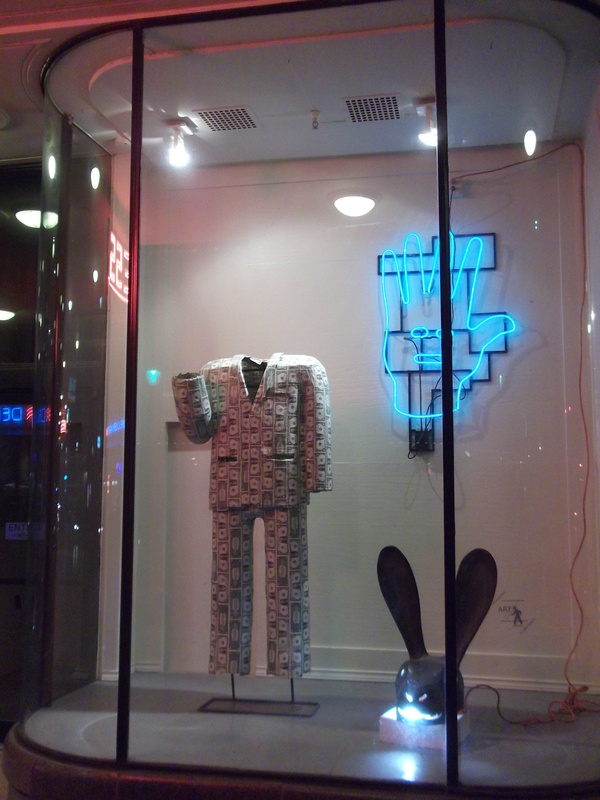 His installation creates a rich backdrop that is reminiscent of old cartoons for passersby to interact with. His intent was to create an environment much like a child would. “Within this world anything and everything could happen; it is just dependent on one’s own imagination,” says Ritchie. Originally from Virginia, Ritchie received his MFA from the Tyler School of Fine Arts in Pennsylvania, and his BFA from Virginia Commonwealth Universit. He has also studied at the Savannah College of Art and Design. He currently lives and works in Boerne. 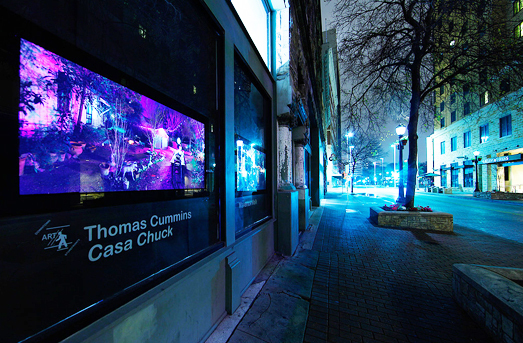 Tommy Hopkins has created an installation that juxtaposes images of Texas flora and fauna with San Antonio’s urban landscape using cut paper, plastics and paint. Hopkins received his Bachelor of Fine Arts in Painting from the University of Texas at San Antonio in 2006 and is currently the Visual Arts Director for the Visual Arts Program at SAY Si, a nationally recognized youth arts program. Hopkins specializes in traditional oil painting techniques and is trained in a variety of disciplines including printmaking, mixed media, and carpentry. His work has been exhibited in galleries and private collections throughout San Antonio. Luis Valderas’ work explores social and cultural ambiguities. Valderas says that his early experiences fueled his interest in Mesoamerican mythology and iconography present in his work where it explores possibilities by isolating and rearranging iconic components of reality. In El Mariachi Lacho, Valderas uses the image of his father dressed in his 1930’s mariachi outfit as an icon and alter ego of the Mexican American hero navigating modern arrays of socio-political structures based on a reinterpretation of ancient myths, icons, glyphs and design sensibilities. 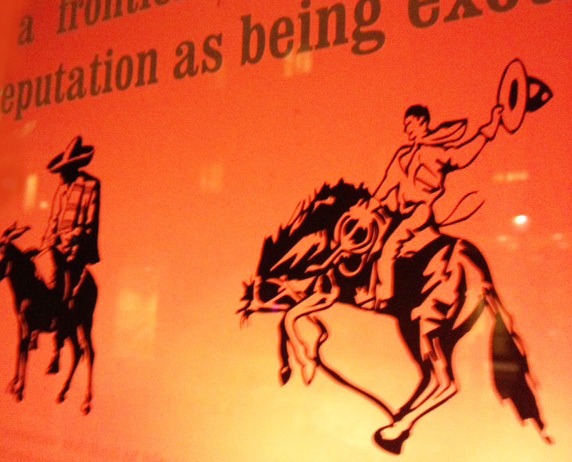 The site specific installation of El Mariachi Lacho presents one image by day and at night turns the storefront window into a light box. Valderas’ works have been featured in two books; Chicano Art for Our Millennium-2004 and Triumph in Our Communities: Four Decades of Mexican American Art-2005, published by Bilingual Review Press. He also founded and organized a nationally recognized annual group exhibit featuring Latino artists (Project: MASA I, II, and III) which focuses on Chicano identities. His works are included in the permanent collections of Arizona State University, the University of Texas San Antonio, and the Art Museum of South Texas. 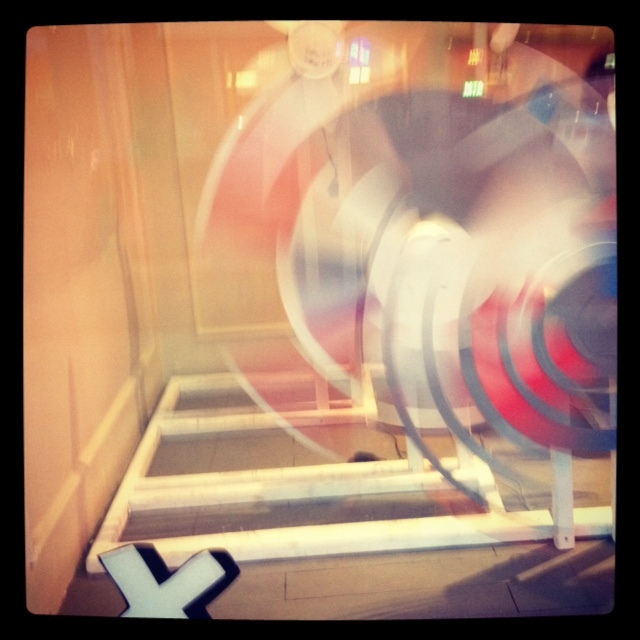 Aldon Mines has created a display of colorful mechanical fans displayed at various positions of depth and height. Mines, who is a graduate of Texas State University, is now a San Antonio-based sculptor who works with wood to create kinetic sculptures with audio components. He helped establish the student-run contemporary art gallery Soda Tooth Contemporary in San Marcos, TX and has participated in numerous local art events such as Luminaria and Artpace’s Chalk it Up. Amada Miller has cut large holes in corrugated plastic sheets that continue to get smaller as they go deeper and adhered them together to create depth and dimension. 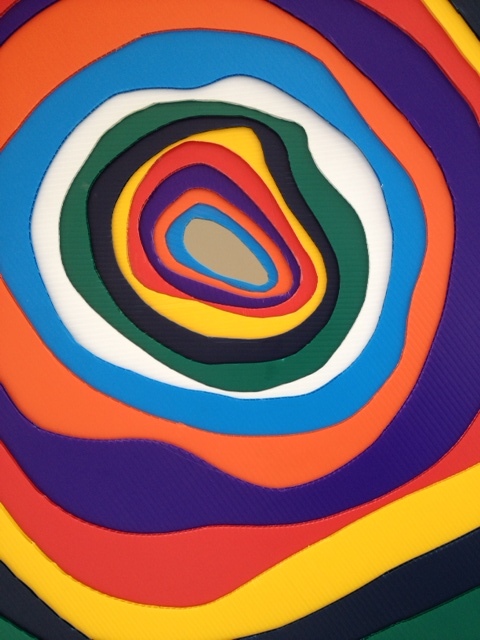 The result is an artwork that looks like a colorful topographical map. Miller is a painter, printmaker, and graphic designer living in San Antonio Texas. She studied as the San Antonio College of Visual Arts and has exhibited throughout town in spaces such as Fl!GHT Gallery and Blue Star Contemporary Art Center. 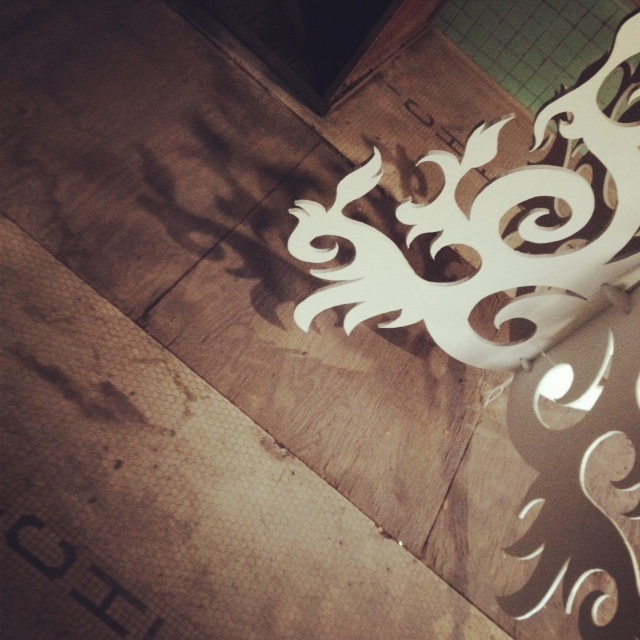 She also owns and operates her own artist-run studio and gallery called Hello Studio. 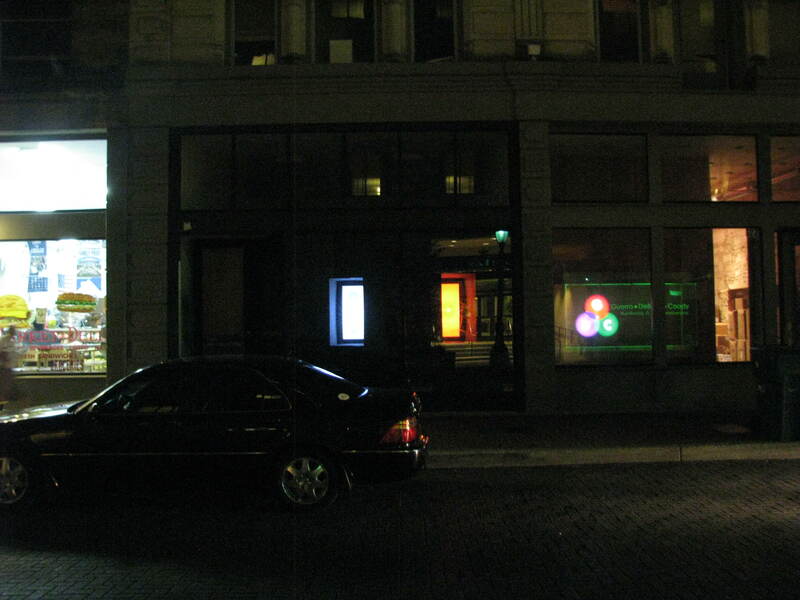 In this installation, Shannon Gowen hopes to gain the attention of the downtown community so that they might reflect on the lack of social interaction and connection within the fast paced environment that they pass through everyday. Born in Las Cruces, New Mexico, Shannon Gowen resided in Central Texas for over 20 years before moving to San Antonio. She received her BFA in Studio Art with a focus in Fiber Arts from Texas State University. Her passions include collage, small scale-sculpture, and public and site-specific installation art and community engagement. She has exhibited throughout San Antonio and has participated in local art events such as Luminaria and Artpace’s Chalk it Up. Aaron Moreno is a conceptual artist and musician from San Antonio, Texas. He specializes in photo-realistic, multi-layered, acrylic and aerosol painting. His installation for “Cut and Paste” is inspired by downtown walks he would take with his grandmother when he was a child. “As a child I was always amazed at downtown but totally unaware to its dangers. My grandmother would always make me hold her hand at all times. When taking the bus, entering a store, crossing streets, or just walking by her side on the side walk. I thought it was a bit much as a child. Now as a father I have understood what she was trying to do. 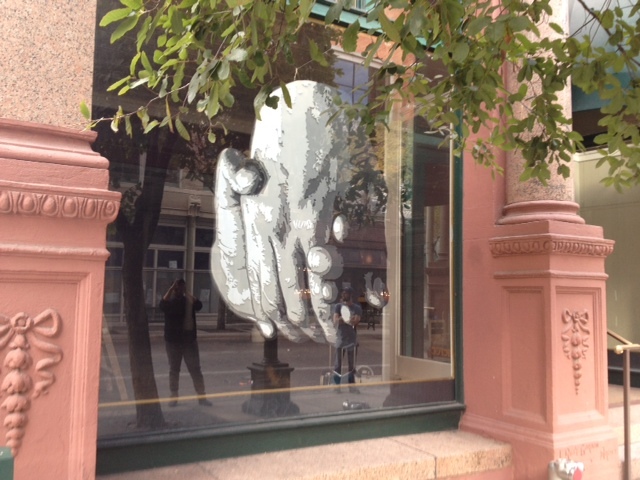 Each time I visit downtown, I think of her, our hands and downtown’s beauty’s and dangers.” Each grayscale value in the artwork is a separate layer of Coroplast that has been painstakingly cut and assembled to create a photo-realistic image of his wife and son’s hands. Moreno studied at San Antonio College for Fine Arts. During the summer, Moreno worked as an art educator for at-risk students at the 1906 gallery. Moreno also co-founded and is a co-owner of Gravelmouth Gallery, an alternative gallery space that showcases contemporary graffiti and street art. Moreno has exhibited all throughout the nation from California to New York and Miami’s Art Basel. 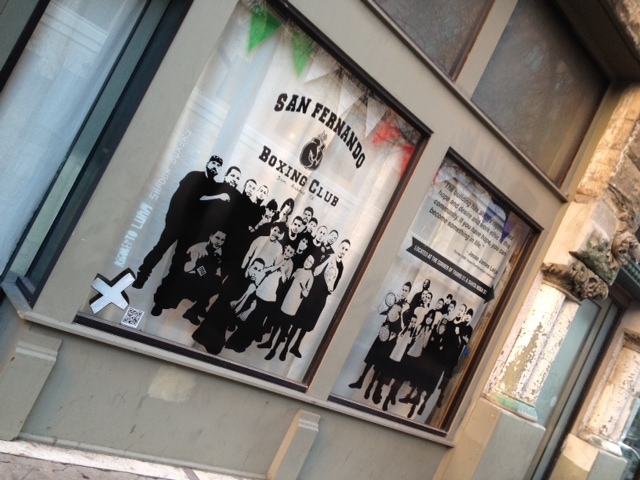 He was also involved in the International Poster Show in Rome. In 2007, Moreno formed the artist collective known as Third Vision Collective based out of San Antonio, Austin and Uvalde Texas. 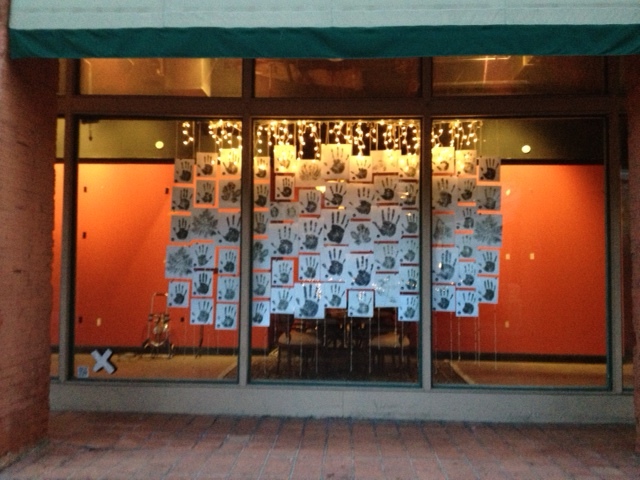 This installation is a collaboration between six visual and media arts students from SAY Sí [San Antonio Youth Yes] and SAY Sí faculty alumni, Chad Gamez. The students have worked with the theme of “Love Letters to San Antonio” and will each express their love of the city through the letters. Being natives of San Antonio, the students have a unique view of growing up in the city and have each developed their personal love of certain areas, natural environments, architectural spaces, cultural and iconic imagery, and realities found throughout the city not easily accessible to other local or visiting citizens. Excerpts of the love letters are on display as text and illustrated imagery through symbols, photos, graphics, and found objects. Special thanks to City of San Antonio District 1 Councilman Diego M. Bernal. 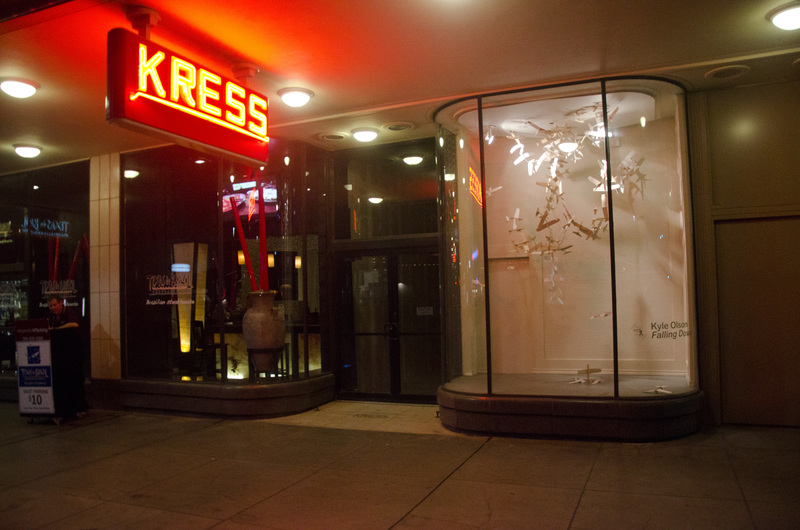 A series of art interventions occupying vacant storefronts along E Houston St. that explores transportation at the crossroads of biology and technology.